09.10-09.25 Intermediate & Low Risk TAVI Trials - Darren Mylotte,Galway. 09.25-09.40 Minimal Access Surgery in Intermediate Risk Patients - EnochAkowuah. 09.40 - 10.00 Varying Transcatheter Techniques Are The Way Forward for AVR - Thomas Modine, Lille,France. - Thomas Walther, Leipzig, Germany. 10.45-10.55 Sutureless Valves -Toufan Bahrami ,Hareﬁeld. 10.55-11.05 Inspiris Valve, 5 Year Results - Olaf Wendler,King’s. 11.05-11.15 Update on the UK, TAVI Registry - Peter Ludman,Birmingham. 11.15-11.25 TAVI for differing Root Anatomy, KeyQuestions - Darren Mylotte, Galway. 11.25-11.35 PEARS for Aortic Root Enlargement - Alistair Graham,Belfast. 11.35-11.45 Hemisternotomy Vs ART Incisions - Max Baghai, King’s,London. 11.45-12.00 New TAVI technologies - Adrian Banning,Oxford. Complete revascularization - let’s discuss! - Julian Strange, Bristol. - Dr Kieta Kikuchi, Chairman of Cardiac Surgery, Wuhan, China. 14.50 - 15.10 HREVS : A Randomised Trial of PCI Vs CABG Vs Hybrid Revascularisation in patients with coronary disease - Vladimir Ganyukov, Kemerovo,Russia. 15.10-15.25 PCI Vs CABG: Syntax, Diabetes is it so clear?- Umberto Benedetto, Bristol. 15.45-15.55 MRI guiding Coronary Intervention, the future - Caroline Daly,Dublin. 16.10-16.25 Economics of Robotic Cardiac Surgery - Lognathan Balacumaraswami,Stoke. 16.25 - 16.40 RA-MIDCAB and TECAB - where is the future- TonyDeSouza, Brompton, London. 16.40-17.00 The Heart Team in Action - Adrian Large,Stoke. 08.30-08.45 What is 2+ MR on Echo? - Roger Byrne,Dublin. 08.45-09.15 Minimally Invasive Solution to Ischaemic Mitral Regurgitation. - Hermann Reichenspurner, Chairman Hamburg Heart Centre. 09.30-10.00 Robotic Mitral Surgery is PrimeTime - Didier Loulmet, NYU,USA. 10.30-10.45 Minimally Invasive surgery: the spectrum-Joseph Zacharias,Blackpool. 10.45-11.00 MIS Success is related to Pain Relief - Ali Parnell,Shefﬁeld. 11.00-11.15 Robotic Mitral Surgery; setting up a program - Paul Modi,Liverpool. 11.15-11.30 Percutaneous Chordal Repair - Steve Livesey, Southampton. 11.30-11.45 Transapical Mitral Replacements: Update - Neil Moat, Brompton. 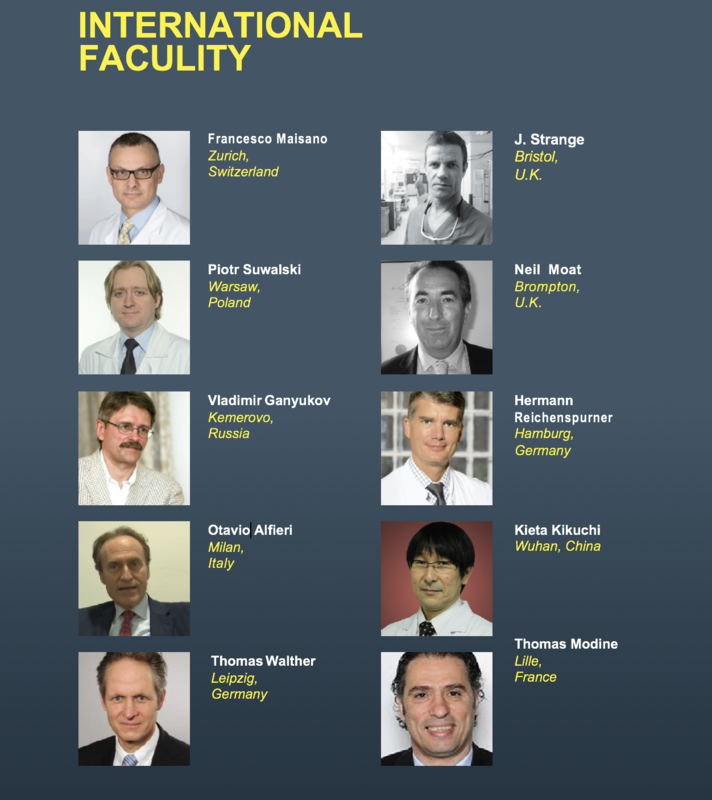 11.45-12.00 Newer Mitral and Tricuspid Technologies - Francesco Maisano, Zurich. - Piotr Suwalski, President-Elect of ISMICS, Warsaw. Professor Sebastuan Stec, Warsaw..
Chaired by: Belfast and Pap-worth. 15.30-15.45 UK Mitral Trial update: - Enoch Akowuah, Middlesbrough. - Neil Moat / Rob Smith, Brompton. 16.00 - 16.15 Scale of The Tricuspid Problem & A New Tricuspid Valve, Bench to Bedside- Martin Quinn, Dublin. 16.15-16.30 Minimally Invasive HOCM Surgery - Joseph Zacharias,Blackpool. - Chris Blauth, St Thomas, London. 16.55-17.10 Affording new devices in the NHS - Olaf Wendler, King’s,London. 17.15 Closing Address - Steven Hunter, President of BISMICS.